The Anthony Kitchen Cart with Stainless Steel Top gives your kitchen a modern touch and packs a handful of functionality into a single cart. The overall size of the cart is 25.2"W x 16.8"D x 33.75"H. The top drawer is 17.3"W x 12.5"D x 3.3"H and allows you to store kitchen utensils and the satin nickel finish provides is aesthetically pleasing. Serve your meals on the removable tray which is 17"W x 13.2"D x 1"H and easily fit 5 wine bottles on the wine rack. The bottom shelf can hold additional wine glasses or other dishware that may need a place to store. The cart comes with 2 locking wheels to keep it in place. The cart is made of solid and composite wood in black finish and stainless steel. Assembly required. 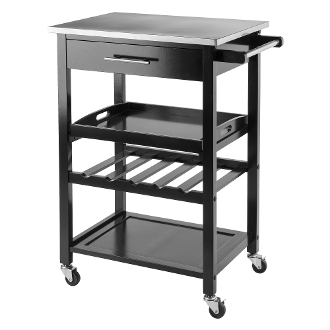 The top drawer is 17.3"W x 12.5"D x 3.3"H. Removable tray is 17"W x 13.2"D x 1"H.
The cart is made of solid wood in black finish and stainless steel. Assembly required.